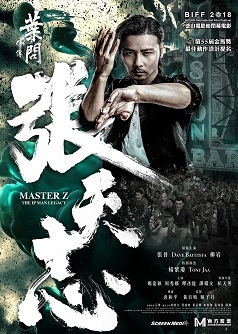 Master Z: The Ip Man Legacy tells the story that after Cheung Tin Chi (Max Zhang) is defeated by Ip Man, he leads a desperate and wasted life. By accident, he rescues Julia (Liu Yan), the sister of Bar Street’s master Chiu Kam Fu, and Nana (Chrissie Chau). With the help of the friends on Bar Street, Tin Chi gets back on his feet again. However, he gets himself into troubles with head of local gangster Tso Ngan Kwan (Michelle Yeoh) and her brother Tso Sai Kit (Kevin Cheng). He also finds out a conspiracy behind the friendly mask of the owner of the western restaurant Owen Davidson (Dave Bautista).